Design is becoming a rich entanglement of different ideas, technologies, trends, cultures and patterns. And this has a profound impact on how product designers approach their work. You can also check out more videos from our world tour on our YouTube channel. The film Powers of Ten was created in 1977 by designers Charles and Ray Eames for IBM. In many ways, it’s a film about perspective, about getting a wider sense of view of things, and how looking at things from a different point of view can change your perspective. It’s also about orders of magnitude, about how difficult orders of magnitude can actually be for us to comprehend. It starts off at a lakeside in Chicago and it gradually zooms out until we’re all the way at the outer edges of the universe. That’s why it gets its name Powers of Ten – every ten seconds we’re ten times further out. I think one of the most interesting points of view that we actually have as a result of this film, is a view of the entire planet earth. To me, this is an almost primal aspect of life on earth. What I mean by that is I can’t imagine a version of life where this view doesn’t actually exist. It’s almost like the Mona Lisa or something, I just can’t imagine a time where this view didn’t exist, and I didn’t know about it. Even this long zoom out view is interesting, it’s a little bit like Google Earth, it seems familiar to me. No big deal. In 1977 when this film was made, there was no such thing as Google Earth. In fact, this was a totally different perspective on the world at that point in time. It was probably mind-blowing to anyone who watched that video at that time. It’s really interesting to me how these technologies, which we often can take for granted, and these views we get afforded, can change our perspective on things. That is what I’m going to try and talk about today. In 1966, ten years before Powers of Ten we didn’t actually have a picture of ourselves from the outside. Hard as it may be for us to believe today, there was actually no publicly available photograph of the planet Earth from space. It didn’t exist. This is the year of the Cold War, and information like this was considered classified military information. The story goes that in 1966 a young guy called Stuart Brand was sitting on the roof of a building in the North Beach neighborhood of San Francisco, in the state of mind that you might expect a young guy in San Francisco in 1966 to be in. Aided or affected by that, he was sitting looking at the horizon, admiring the view. And as he looked out at the horizon, he imagined that he could see a slight curvature to the earth. Furthermore, he imagined what would happen if he started to zoom upwards himself from that point of view, like an out-of-body experience. As he would rise further up, the curvature would slowly increase more and more until it actually turned into a circle. He was, in some sense, looking at the entirety of the earth in one single field of vision. Again, perhaps aided by his state of mind, he had a realization, an epiphany, that if only everybody in the world could share this perspective, this point of view, then it would change our actual perspective on all sorts of different things about life on earth. About war, politics, environmentalism, and so on. 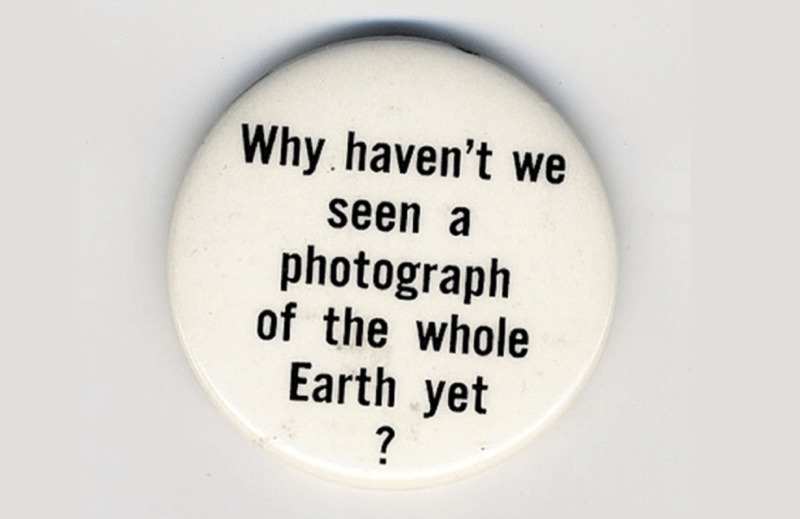 When he finally made it down off the roof again, he decided to go and make these buttons to give to people, and asked them to petition NASA to release a picture of the whole earth. Surprisingly, it actually worked. It led directly to the release of the very familiar and famous blue marble photograph we all know today. Of course, this was also the era of the space race. It was a period of intense technological optimism, intense progress and ambition, and throughout this era, it felt to a lot of people that technology was collectively driving them, literally, towards some new future. Looking back and reflecting on this, the philosopher David Loy, had this to say. It’s amazing to me that technology alone was able to design and build a rocket, to get into it, blast off, design and build a camera, point it backwards and take a photo and send it home. It’s amazing the potential and the power that technology has to change our state of mind, our frame of mind, how we think, and how we see ourselves. I run the product design team at Intercom, and the work that we do on a day-to-day basis is somewhat more grounded than all of that. I do try in some sense to take some inspiration from that and think about how we can change our own perspective in the work that we do. What might an overview effect for digital product design feel like? How can we step outside our day-to-day and look back and think about where we’re actually going with all of this? First of all, I want to just take a step back, to widen our picture a little bit. If we’re in this age of entanglement right now, what came beforehand? My thesis is that there are four important phases in the evolution of personal computing. There are many other ways you could choose to slice it or categorize it; these are just mine. My main idea here is that we have already gone through three eras and that we’re right on the cusp of a fourth. This may seem like a somewhat scary and exciting place to be. It means that everything is up for grabs. This is somewhat our zoomed out, whole earth view of what we’re talking about. That’s why I want to briefly zoom into each one of these individually, so we can get on with getting entangled. Let’s look at the first age – the age of augmentation. To begin with, I should say what I mean by augmentation. The notion of technology augmenting human intellect is not a particularly new one. For example, if you’re a bit better than me at mathematics, you can probably do some relatively complex arithmetic in your head. But if I ask you for something complex like “What is the square root of 2,397 X 12?”, you’re probably going to be stuck. Now let’s say I give you a pencil. This is a relatively simple piece of technology. It’s wood pulp, some graphite. Maybe I give you some paper as well to write on. Now, equipped with this piece of technology, you’ll probably solve that problem in under a minute. Just by giving you that technology, you’ve augmented your ability, you have extended your cognitive capacity. The notion of augmentation in and of itself isn’t particularly new. But for me, the era of augmentation, especially as it relates to personal computing, began on the night of December 8th, 1968, at the Stanford Research Institute. 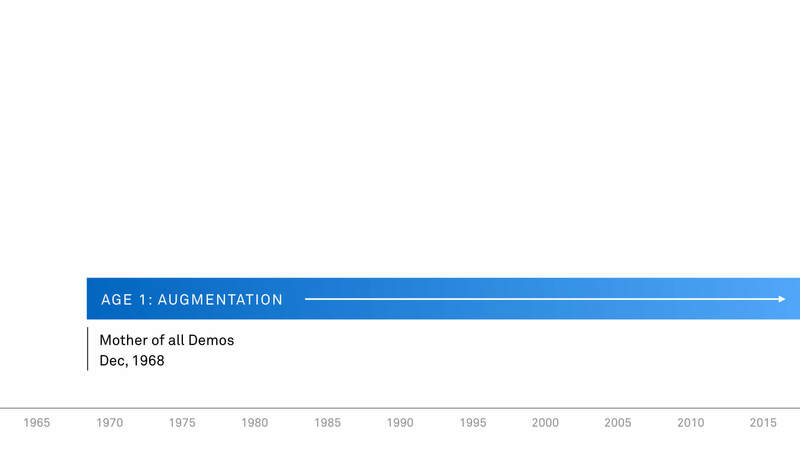 It has since become known as the mother of all demos. Stuart Brand was there – the guy who climbed down off the roof and made the buttons. 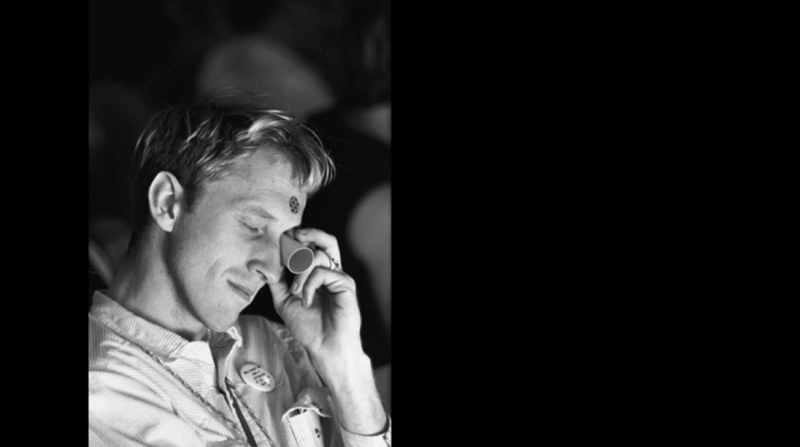 He wasn’t just an acid-dropping, roof-climbing, button-making hippie. He was also deeply involved in technology in the Bay Area in the 1960s, and like I said, he was there on that night in December, 1968. He was actually the camera operator at the mother of all demos. The real star of the show was Douglas Engelbart. Engelbart ran a research project at SRI called NLS online system, and the demo was of his work on NLS. 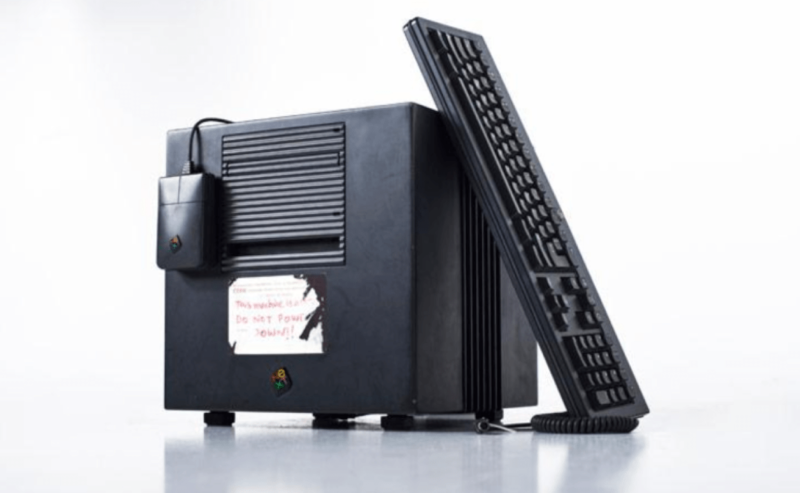 A crazy number of personal computer innovations were launched or introduced to the world for the very first time as part of this demo. Engelbart introduced, among many other things, the computer mouse, video conferencing, graphics, windowing, teleconferencing, hyper text, word processing, hyper media, revision control, dynamic file linking, and collaborative real-time file editing all in one demo. It lasted about an hour. Like that picture of the earth, it’s really hard for us to think of a state of the world in which these technologies aren’t just part of the world around us. This was the iPhone keynote of its day. In addition to introducing all of these new technologies to the world, Engelbart outlined a very important purpose, a very important vision to go along with it. He saw the potential of all these technologies to extend human abilities, or augmentation as Engelbart called it. By augmenting human intellect, he meant increasing the capability of a man to approach a complex problem situation, to gain comprehension to suit his particular needs and to derive solutions to problems. Engelbart was thinking incredibly broadly. He wasn’t just trying to create a new product or build a new app. He was trying to create a whole new way of being human. The age of augmentation that started on that night in 1968 has been continuing ever since. Engelbart was right – technology has been a part of our everyday lives and we’ve certainly become more and more augmented by technological ability as time goes on. The mother of all demos led to similar projects at Xerox Park, which in turn, inspired the Macintosh, which itself kick-started the personal computer revolution. Augmentation hasn’t just stayed with us, it has actually sped up over time. Which brings us to the second age – the age of acceleration. I’ve pegged the start of this age to November 15, 1971. 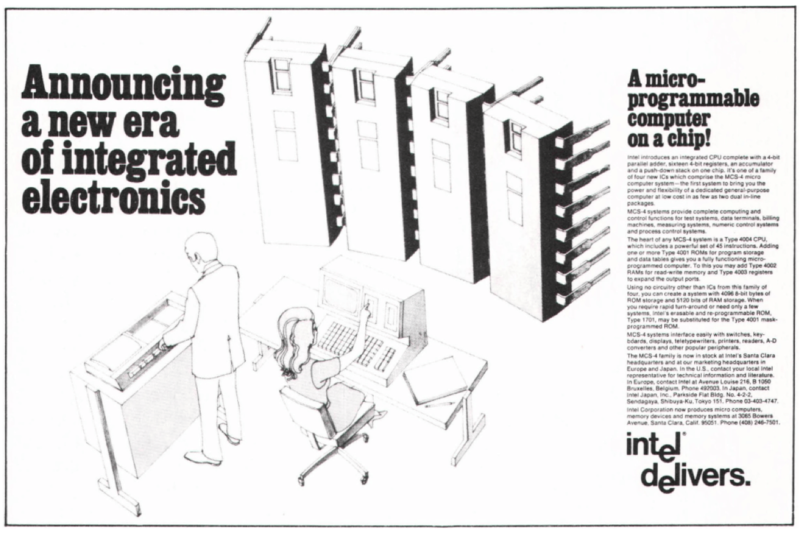 An advertisement appeared in a magazine called Electronic News for the Intel 4004, the first commercially available microprocessor. It might not look like much, or the start of a new era, but in my opinion it is. As you can see from the ad, it was certainly the start of the standing desk era, so it was worth something at least. 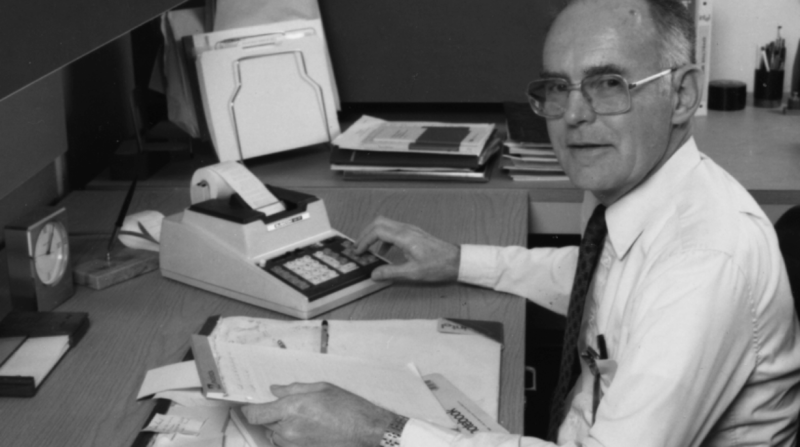 Here is Gordon Moore, a co-founder at Intel who worked at the time of the 4004. Here he is pictured with a descendant of Engelbart’s inventions, augmenting his own ability to do work. Using these tools and others like them, he invented his own, so there’s a boot-strapping element to this. Gordon Moore also made some interesting observations. What Gordon is best known for is the single most important chart in at least the last 50 years of technology. This is Moore’s Law, which states that the number of transistors in an integrated circuit doubles approximately every two years. Or in simpler terms, computers get smaller and faster and cheaper at just this remarkably consistent rate. This has held true since the early 1970s. It’s an insanely consistent trend and one that has propelled and driven the entire computer industry since it was first made. What’s more, you can extend and extrapolate this. If you imagine a dotted line continuing at the top of the chart, you can guess with very near certainty what is coming in the future. This certainty is also what has propelled the computer industry since the early 1970s. 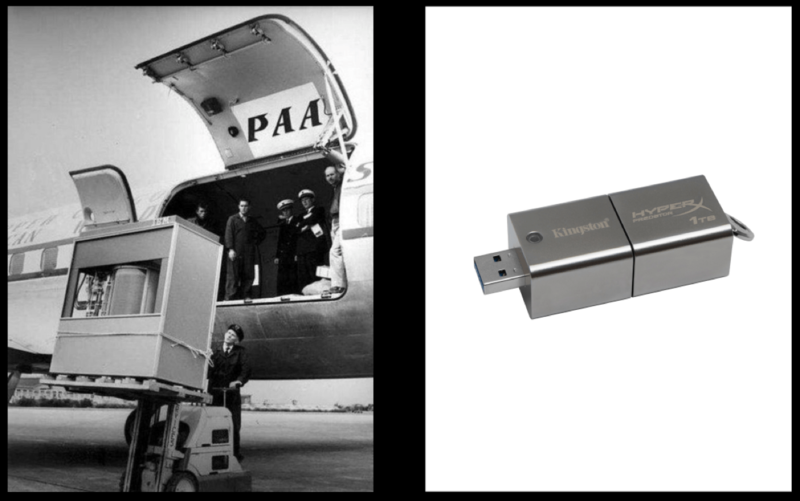 By way of illustration, on the left above is what a 5MB hard drive looked like in 1956. It weighed about a ton, and you could store the equivalent of about one MP3 on this bad boy. On the right is what a one terabyte thumb drive that you could buy off Amazon looks like today. 200,000 MP3s, the equivalent of about maybe a year and a half of nonstop, constant, 24-hour music listening. And you don’t need an airplane to carry it around either, which is handy. 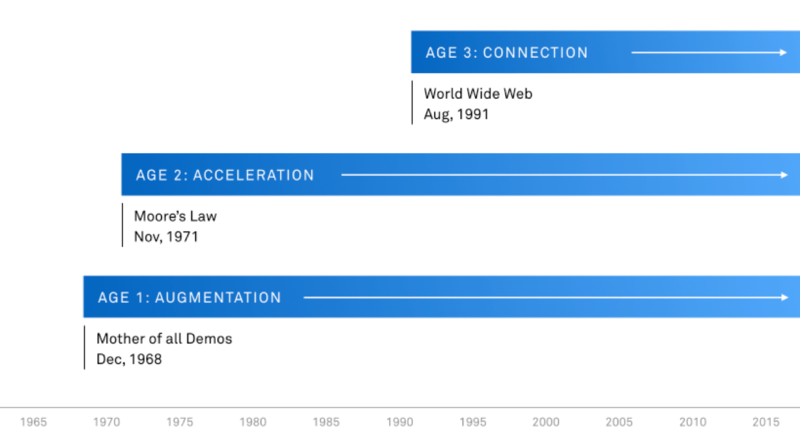 The age of acceleration, which started with Moore’s Law, has been moving forward ever since. Computers have gotten faster and they’ve gotten cheaper and it simply hasn’t stopped. That trend has combined with the ongoing augmentation that has also been increasing, by virtue of the fact that we’re building more and more software over this period. We start to see something really interesting here. These aren’t discreet ages. One doesn’t end as the next one starts. They actually build on each other, they compound. Then, of course, everything became connected. In August 6, 1991, the first webpage went live. Tim Berners-Lee posted a short summary about the World Wide Web project and in a suitably meta way launched the World Wide Web, which turns out to have done well. Maybe you’ve heard of it. Berners-Lee was working at CERN at the time, a nuclear research facility in Switzerland. If I’m totally honest, I can’t actually tell you what creating the web has to do with nuclear research, but I like to tell myself he was basically just messing around when he should’ve been doing real work. It seems like a pretty apt start to the web anyway. This is the actual machine, a Next box, where the first site was hosted. So this single machine once hosted the entire web. As an aside, there’s a sticker on the side that says: “This machine is a server, do not power down”. As if to say. “Please nobody plug out the web”. What’s more, some early internet troll has clearly come along and tried to peel it off. I just feel like all of internet culture comes from this one sticker. These are the forces that have brought us to the incredible place we’re at today. It’s what has led to the world having smartphones. This has been the most fantastic, cultural and technological change that I can really imagine. I feel we can’t quite comprehend the magnitude of it. We’re still in the middle of it, we haven’t pulled out, we don’t have a sense of perspective to really see what it’s all about. Billions of people, including some of the world’s very poorest, now have access to information and access to communication via super computers that they carry around in their pockets. The digital divide that people talked about just a few years ago, has basically evaporated. All of this change happened in under a decade. This is what happens when these forces combine. Augmentation, acceleration, connection. This is a wonderful and profoundly levelling thing for all of humanity, and it seems like a great point for us to have actually reached. Everyone on earth has pocket supercomputer that augments their ability to communicate and has given us this emerging global consciousness. Compare this abundant access to information with the situation we were in just half a century ago, where none of us had even seen a photo of the whole earth. We’ve had our three ages of computing, we’re all up to speed. All that needs to happen is for all of these trends to continue, unabated, and uninterrupted, and everything will be fine. Unfortunately, the bad news is the party is basically over. All three of these ages that have built on each other and compounded are all about to end, and they’re all going to end at the same time. The ends of these eras may not mean the benefits that they brought us disappear. But it does mean massive changes are coming, and it especially means massive changes are coming for those of us who build things with technology. Because the foundations on which all of the things that we’ve built, all of our assumptions for what’s coming next, they’re all about to change. First, augmentation of human intellect is being displaced by the rise of autonomous systems. Look for a second at the cutting edge work that’s being done in AI, in machine learning, in autonomous robotics. All of this work is being done independent of humans. We’re moving the focus of computer science very quickly away from augmentation of humans, where it’s been for the last 50-odd years, to displacement of humans, a totally different thing. This means a massive change for a lot of us. 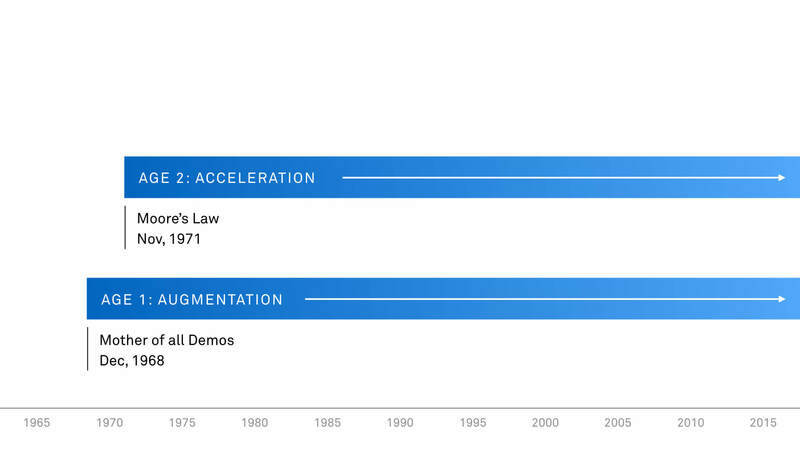 Next up is Moore’s Law. The joke goes that the number of people predicting the end of Moore’s Law doubles every two years. But it does look like physics is set to step in very soon. It does look highly likely we’re not going to be able to enjoy these benefits indefinitely. Some chips now have elements on them that are just 14 nanometers across. The next generation of chips coming in the next year or two are due to have elements of just 10 nanometers across. Just take a couple of steps forwards on that trend – for a chip to have an element of two nanometers across, that is the width of ten atoms. It’s just not simply possible for this trend to physically continue. 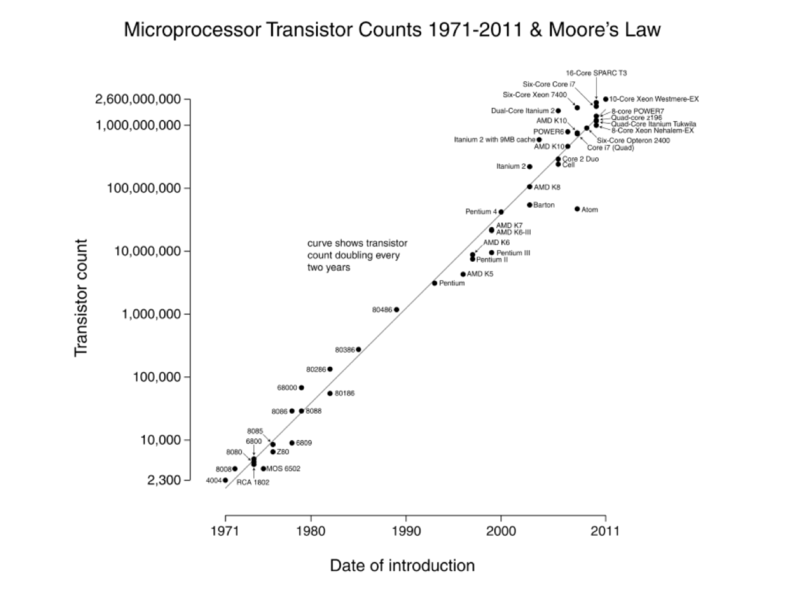 Moore’s Law is coming to an end and it portends this massive change for us. Connection, meanwhile, has a natural limit. All of the adults in the world will soon be connected to the internet. This is a fantastic thing in may ways, but it does mean we can no longer look forward to this endless growing of the pie to drive growth and to drive change. We’re going to top out, there is big change coming here too. I think the answer to that question is: in many different directions at once. This is what its all been leading up to – the fourth age, what this age of entanglement is all about. It’s as much a transition away from the stability and knowability and predictability of these previous ages as it is the beginning of some new trend. 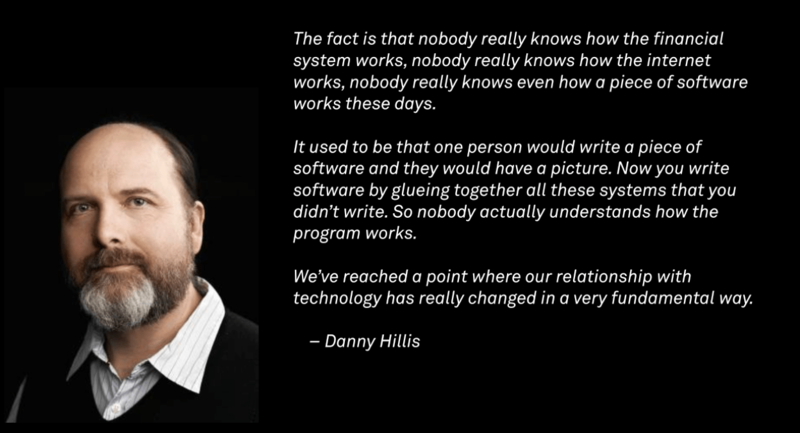 I stole the specific phrase “entanglement” from the writer and inventor Danny Hillis, who basically thinks that the very technology that we built has progressed to the point where it’s no longer understandable by us anymore. Rather than having something simple and predictable, we now have these complex systems of behavior beyond our understanding. We’re starting to detect signs of this. Think ahead to AI systems that will increasingly do things without you really knowing how or why they did them. Think of your autonomous car that’s going to drive you to work in the morning, and choosing a route without you really knowing why it chose that way, or even what went into making that decision. Think about how we interact with these systems. We don’t know how they work and in some sense we don’t really know whether or not we can trust them. A really simple example of this is if you’re messaging with a person. Is that actually a human or is it a bot? There are systems like this emerging that raise these questions. As a designer, this is worrying because there’s no clear-cut answer to questions like this. Just like programming used to be simple, design used to be relatively straightforward. We even gave it a nice simple name that described its knowability: Human Computer Interaction. It was about input and output, cause and effect. You click on a thing over here and something else happens over there, so it was relatively straightforward. Now we’re in a much more complicated operating environment. We’ve got a vast array of people and connections and behaviors and artificial actors all played out across this immense global scale. How do you even do design in a scenario like this? It’s almost as if we’ve gone from being asked to design simple buildings, relatively straightforward, to design entire cities and to have some idea of how it’s all going to turn out at the end. It’s simply too much for one person to hold in their head at any one time, and it’s not how these problems work. Actually, maybe that example holds a hint for us, maybe there’s something to be learned from that. Because cities, of course, can’t really be designed either. There’s a loose framework there, but really they grow and they adapt over time. They’re fantastically complicated, but most of them work pretty well and some of them are truly great. No city could’ve been centrally designed by one single person who knew exactly how it was going to turn out in advance. That’s just not how it works. But I do think that it is indeed possible to have ideas about how to approach design and design problems even when operating inside these complex systems that I’m talking about. First of all, I think it’s really important to have a vision for the product or the design work that you’re doing. By vision, I don’t really mean a picture of what the solution looks like, a very prescriptive notion of what you’re going to go and build. Rather, a vision is more like a sense of how the world is going to be different as a result of your product being successful. What’s nice about this is it absolves you of the responsibility of having to say exactly what the solution is and go and bet on that one thing. Instead, you just need to have a vision and work towards that. I think it’s really important to think in systems. 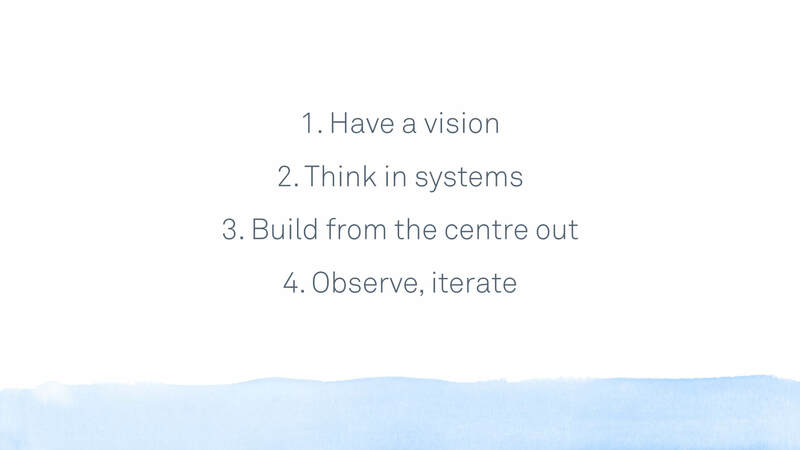 If your product is essentially going to be interacting with a interconnected world of systems, it’s valuable to think about your product as a system in itself. What I mean by that is could you draw a diagram of your product? I don’t mean the UI, but a diagram of the objects that make up your product. I think it’s really important to build one thing at a time and start from the center and build outwards from there. To find some small, reasonably doable version of your idea that you can build in a short amount of time but that reflects your vision and that will allow you to validate your vision. From there, you can start to gradually add layers around that. What will happen over time is the layers you add will be different. You’ll get to see, as you add each new layer, how people react and how the world reacts to your product. The last thing I would say is that it’s really important to observe, as you add each of these layers, what’s actually happening and be willing to iterate in different directions that are maybe not at all what you would’ve thought, or if you had tried to imagine it all from thin air from the very beginning. The good news is that if you look at these, they’re actually pretty normal design principles. There’s nothing too crazy about them. In fact, these are the types of things most good designers have probably been doing anyway. Maybe it’s the case that sensible design isn’t set to change all that much. Maybe we don’t really need to be intimidated by the prospect of all of this change. Many systems, if you really dig into them, follow a similar set of emergent patterns and behaviors, whether it’s ants or cities or people or organizations or networks or maybe even software. In a way, all of these things are interconnected. They very much share at least common traits, common behaviors, common emergent properties. This, to me, is what this age of entanglement is all about. It’s the opportunity to recognize and draw parallels between disparate things. To take a bunch of different threads and weave them into some new, combinatorial possibility. It could possibly be the case that software is graduating from its earlier, simple, binary, primordial state, towards becoming a more fully-fledged part of the natural world. Something that is probably more organic and more uncontrollable. But there’s also beauty to the emergent behavior there. That’s really what I get if I zoom out. This is what design, for better or for worse, has become: a wonderfully rich entanglement of different ideas and technologies and trends and cultures and patterns. As designers, as makers, as technologists, or just people who are interested in the adjacent possible, it’s incumbent on us to try and become comfortable with this, to embrace the chaos of it. Maybe it is the case that what we’ve all become used to up until now, this sense of knowability, this sense of predictability about how technology works and the future. What if that was just a temporary aberration that we got to enjoy for the last little while? What if we’re moving back to a more natural state, with technology taking its rightfully uncertain place in the world? Douglas Engelbart was certainly in that position at the beginning. He was not really in a position to have any way of knowing what was coming next, any stable sense of what the future held. Instead, he had to create a vision. And he had to start a project. And he had to just follow that thread to see where it would take him. As it turned out, it took him, and it has taken all of us, in some very interesting and rewarding directions.